Crimea referendum 2014: Russia’s margin of victory shows the election was rigged. 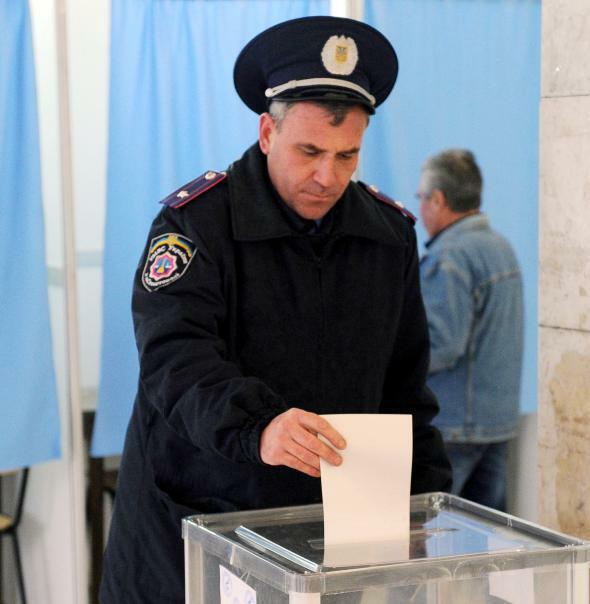 A policeman votes at a Crimean polling station on March 16, 2014. The people of Crimea have spoken. In yesterday’s referendum, they voted overwhelmingly to secede from Ukraine and join Russia. According to Russia’s Itar-Tass news agency, the vote was 93 percent to 7 percent. According to Russia Today, it was 96 percent to 3 percent. It’s an amazing victory. Even more amazing when you consider that according to the most recent census, 37 percent of the Crimean population is ethnically Ukrainian or Tatar. Yet only 3 to 7 percent voted against leaving Ukraine and embracing Mother Russia. To be fair, it’s not quite as amazing as last week’s election in North Korea. There, beloved leader Kim Jong-in was re-elected to the parliament with 100 percent of the vote. The ruling party holds all 687 seats. And last year in Cuba, voters approved 100 percent of the national assembly candidates put forward by official nominating committees. How do exemplary democracies such as Russia, Cuba, and North Korea achieve these mandates? By rigging them, of course. As Charles Krauthammer pointed out long ago, the fraudulence of an election is proportionate to the margin of victory. My colleague Joshua Keating recently updated this pattern with stellar vote shares from Azerbaijan (85 percent), Kazakhstan (91 percent), Belorussia (93 percent), Turkmenistan (97 percent), Syria (98 percent), and Chechnya (99 percent). In The Dictator’s Learning Curve, Slate’s William J. Dobson notes that smarter tyrants have learned to water down such ridiculous margins. The 612 candidates for deputies to the National Assembly of People’s Power and the 1,269 candidates for delegates to the 15 Provincial Assemblies of People’s Power, were elected on February 3, according to information given by Alina Balseiro Gutiérrez, president of the National Electoral Commission (CEN), in a press conference. Once again, Cubans exercised their universal, free and democratic right to elect their representatives, she affirmed. The first word in the story—“the”—explains the rest. In Cuba, no alternative candidates are on the ballot. You can vote for the official candidate, or you can vote against him and take your chances. Among the nearly 2,000 official candidates, not one was rejected. Same deal in North Korea. In Crimea, the recipe for overwhelming victory was subtler. First, you narrow the ballot to two choices: joining Russia or increasing Crimea’s autonomy from Ukraine. You exclude the status quo. Then you saturate Crimea with 21,000 Russian troops and put armed men outside polling stations. Citizens with misgivings about joining Mr. Putin’s Russian Federation, particularly Crimean Tatars, a Muslim Turkic people with a history of persecution by Russia, generally opted to stay home rather than participate in what they called a rigged vote. At a cultural center that served as a polling station in Bakhchysaray, the historical home of Crimean Tatars, few if any Tatars were casting ballots. The Crimean election reminds me of a focus group I observed years ago, after Slate had erected a pay wall. Microsoft, which then owned Slate, had recruited members of the focus group from people who said they had visited the site recently. I listened to everything the participants said and took notes. I thought I was learning what our audience thought. After the session was over, the moderator came backstage to talk to me and the other observers. The important finding in the focus group, he explained, wasn’t what the people in the room thought. The important finding was that all of them had been reading Slate before we put up the pay wall. We weren’t acquiring new readers. The pay wall was killing us. The lesson from Crimea is similar. Sometimes the message of an election isn’t what the voters said. It’s who didn’t vote. In Crimea, the people we needed to hear from weren’t even in the room.